When I do my webinars, I end with a summary slide to help the audience members remember what I’ve said. A slide with a list of bullet points won’t work very well, because text doesn’t jog the memory. So I use a visual summary slide. Here’s an example. Choose a slide that presents each of your main points. You probably shouldn’t have more than 5 or 6. Take a screen shot of the slide that covers a square area. This means you’ll have to omit the edges of the slide. 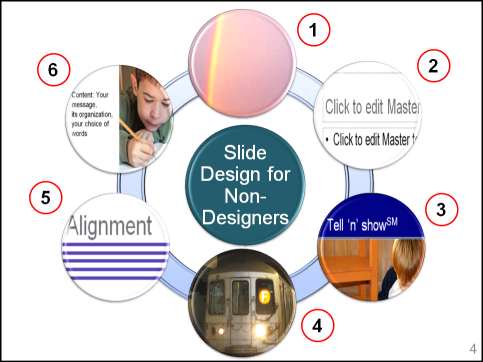 The reason for this is that PowerPoint will stretch or shrink the image to fit the circle; if you include the entire slide, the image will be distorted. You can press the Print Screen button, use Snip in Vista, or use a screen capture program like TechSmith’s SnagIt. 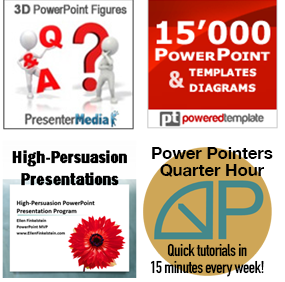 Save the screen capture as a JPG or PNG file in the same location as your presentation. If you use the Print Screen key, open Paint, which comes with Windows, paste, and then save. Create your shapes. For this diagram, I used PowerPoint 2007’s SmartArt feature. I chose Insert tab> Illustrations group> Smart Art. In the Cycle category, I chose Radial Cycle. 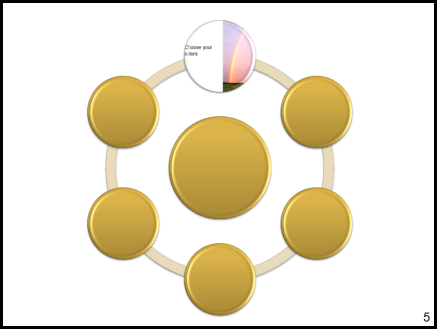 If you need to add a circle on the circumference, click an outside circle and go to SmartArt Tools Design tab> Create Graphic group> Add Shape. To delete a shape, select it and press the Delete key. Drag the corner handle and enlarge the diagram to cover the entire slide. Choose a style from the SmartArt Styles group. The diagram is meant for text, not images. (Some SmartArt types do take images.) To add flexibility, right-click the selected diagram and choose Group>Ungroup twice. That’s right, you need to do it twice. Double-click the top circle to select it and display the Format tab. 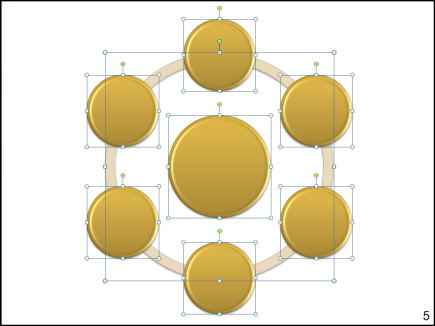 In the Shape Styles group, choose Shape Fill> Picture. Navigate to your image and double-click it. Continue with the rest of your circles until you’re done! Fab idea with the visual summary. Is there a similar way to acheive this effect in Powerpoint 2002? Glad you like it! While you can’t do the bevel effect in 2002, you can certainly fill AutoShapes with a picture, so the answer is yes. Give it a try! I never recognized the summary slide as made with PowerPoint 2007. I guess that is what custmization can do. Can you explain why you have ungroup? Ungrouped, the SmartArt lets you insert only text into the circles. 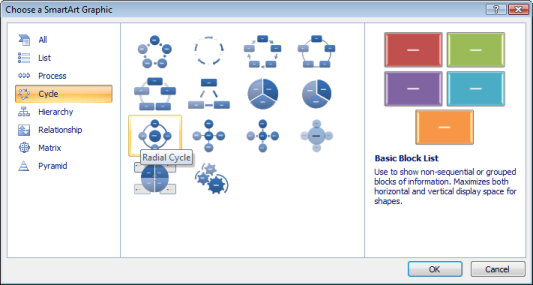 When you ungroup, you get regular shapes and you can format them in any way, including filling them with a picture. Am trying to fill an Autoshape (Powerpoint 2002)- maybe I am being dense here but am getting no option that lets me fill the form with an image.Any ideas? It’s pretty hard to find, actually. In fact, impossible, if you don’t know where to look. Right-click and choose Format AutoShape. On the Colors and Lines tab, in the Fill section (at the top of the dialog box), click the Color drop-down list and choose Fill Effects. Click the Picture tab. Then click Select Picture. as I click right, there is no ungroup item. can you help me please? You need to make sure it’s selected. Does that help?